No glitter falling off, premium quality craft paper dots with thread. 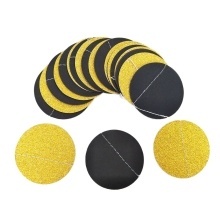 Each circle dot measures 50mm in diameter, versatile and universal size for almost all events. Made of paper, environmental-friendly and no harm to people&apos;s health. No glitter falling off, premium quality craft paper dots with thread. Each circle dot measures 50mm in diameter, versatile and universal size for almost all events. Can be folded up easily for reserve, easy to pack and to be reused. Used to decorate background walls of various parties, festivals, windows, etc. 1. Please be careful when you unroll and unwrap the paper garland, the thread is easy to be tangled. 2. Please allow 0.5-1" error due to manual measurement,because the paper garland is sewed by hand. 3. Display screens are not calibrated same, item color displayed in photos may be showing slightly different from the real object. Please take the real one as standard.